Everyone deserves to be treated with respect — even during an argument. If your partner curses at you, calls you names or ridicules you, you can let them know those behaviors are not okay. If they don’t stop, walk away and tell them you can continue the discussion after a break. Typically, arguments happen when one partner’s needs or wants are not being met. Try to get to the heart of the matter. If your partner seems needy, maybe they are just feeling insecure and need your encouragement. If you’re angry that your partner isn’t taking out the trash, maybe you’re really upset because you feel like you do all the work around the house. Learn to talk about the real issue so you can avoid constant fighting. If you and your partner can’t resolve an issue, sometimes it’s best to drop it. You don’t have to agree on everything. Focus on what matters. If the issue is too important for you to drop and you can’t agree to disagree, there may be a compatibility issue. Compromise is a major part of conflict resolution and any successful relationship. It’s not always easy, but strive to find a middle ground that can allow both of you to feel satisfied with the outcome. Is this issue really important? Does it change how the two of you feel about each other? Are you compromising your beliefs or morals? If yes, it’s important that you feel comfortable standing up for how you feel. If not, maybe this is a time for compromise. Also, consider your partner’s arguments. Why are they upset? What does the issue look like from their point of view? Is it unusual for your partner to get this upset? Does your partner usually compromise? Are you being inconsiderate? Still arguing? If you try these tips but still argue constantly, consider whether the relationship is right for both of you. 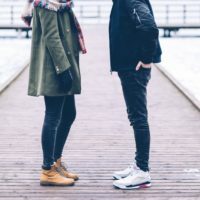 If you wish to continue the relationship, you might consider attending counseling together (but only if there is no abuse present in the relationship). You both deserve a healthy relationship without constant conflict. Although conflict is normal, your arguments shouldn’t turn into personal attacks and should never become physical. If you can’t express yourself without fear of retaliation from your partner, you may be experiencing abuse. Learn more about verbal/emotional abuse and how to draw the line between it and normal disagreements. You occasionally spend time with friends or family instead of spending all your time with them? They check your phone and don’t like the texts or calls you received? Whenever you leave the house they accuse you of cheating? If you feel that your relationship might be unhealthy or abusive, call or chat with one of our advocates. We can help!